I read to my children ALL the time when they were young, and if nothing else, I wanted them to be readers! And, fortunately, they are! There are so many benefits associated with reading to children at an early age from bonding to improved vocabulary (which helps now that the SATs are right around the corner). This lesson explores the amount of time students spend reading to other screen and electronic device activity and encourages them to research and explore why reading to children is so beneficial to their growth and development. 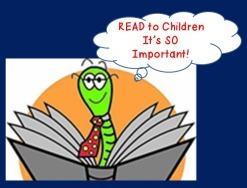 I’ve also included a fun component for students to learn the do’s and don’ts of reading to children while encouraging them to enhance their own oral presentation skills by reading aloud a children’s book. This is great practice for classes who have direct day care experiences connected to their programs and even if you don’t it’s an important skill for students to develop for future use as parents or caregivers. 11.4.12 C Analyze practices that optimize child development e.g., stimulation, safe environment, nurturing caregivers, reading to children). 11.4.12 E Identify practices that develop the child’s imagination, creativity and reading and writing skills through literature. Complete the “Ticket to Class” cartoon and questions. Be prepared to discuss. Background Research: To learn more about the importance of reading to children complete the Internet Scavenger Hunt. Emphasize that answers need to be in complete sentences and documentation from websites used needs to be included specifically for each question. Using the researched information, have students complete one of the following activities (your choice or allow students to choose). Projects can be hand generated or computer generated and will be presented to the class. Activity #1: Place students in small groups of 2 or 3 and have them create a poster titled “Top Ten Reasons to Read to Your Children”. This will be listed in the style of Dave Letterman’s “Top 10” lists. Try to be humorous but truthful. Be sure to make your poster neat and attractive, include title and pictures, illustrations or graphics. Pull all of this together and reinforce materials by showing the DVD “Ready to Learn ” hosted by Jamie Lee Curtis and LeVar Burton (available from Amazon). Now that you know the importance of reading to children, how do you read to children? Discuss responses. Interactive Oral Reading Activity to Demonstrate the Do’s & Don’ts of Reading to Children.Cut apart Nursery Rhymes and randomly assign one or two to each student depending on class size. At the bottom of the Nursery Rhyme is a “DO” or “DON’T” that students must “dramatize” and illustrate while reading their Nursery Rhyme. The audience (rest of class) must try to guess what the student did “right or wrong” and then briefly discuss/explain why it was right or wrong. Follow up with the “Do’s & Don’ts reinforcement assignment to be sure they were paying attention. Students will choose a children’s book and practice reading aloud with a peer before actually presenting orally to the class. The entire class will be peer evaluating each reader along with the teacher. Thanks this lesson was engaging and fun for my students. We didn't do the scavenger hunt, but reading the Do/Not Do rhymes made the class laugh. Students just completed writing original stories online using MYSTORYBOOK.com and will present their stories to the class. Thank you. I am only on day 1 but I think my kids are learning alot from these lessons.